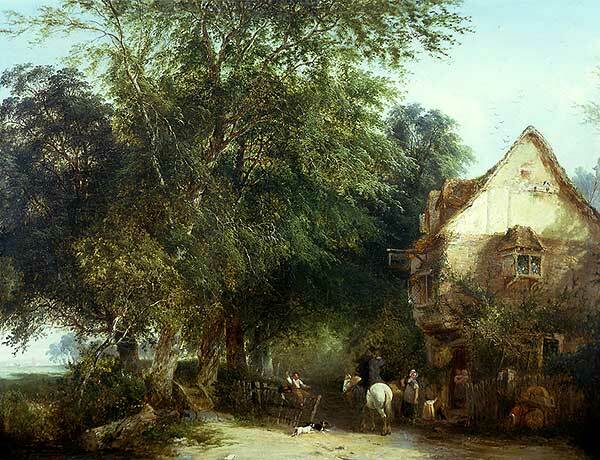 Henry John Williams, called Boddington, was born in 1811 in the St. Marylebone district of London, as the second son of English landscape painter Edward "Old" Williams. 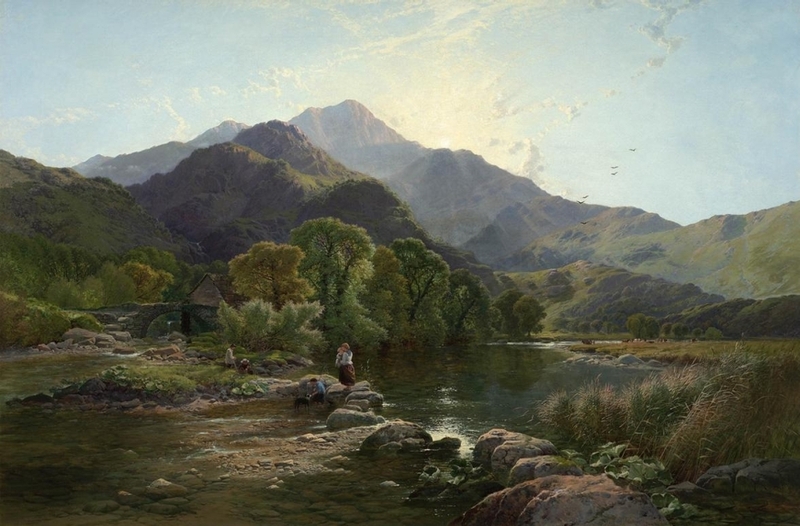 He had five all brothers, all of whom became landscape painters, and though born Williams he changed his surname to Boddington to disitinguish his art from that of the rest of his family. 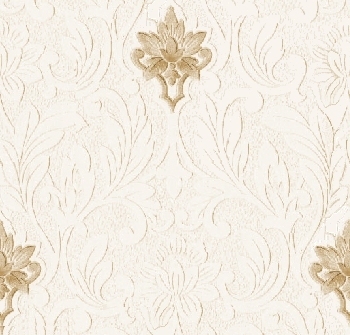 Henry showed an early talent for painting and received his only formal training from his father. He soon developed his own style, characterized by country scenes with sunlight filtering through archways of trees onto animals or people standing in a warm glade, or shadowed country lane. He also painted river scenes, particularly along the Thames, and graced many of his paintings with country houses. He enjoyed painting on large canvasses, which allowed him to capture all the beauty and grandeur of the English countryside. 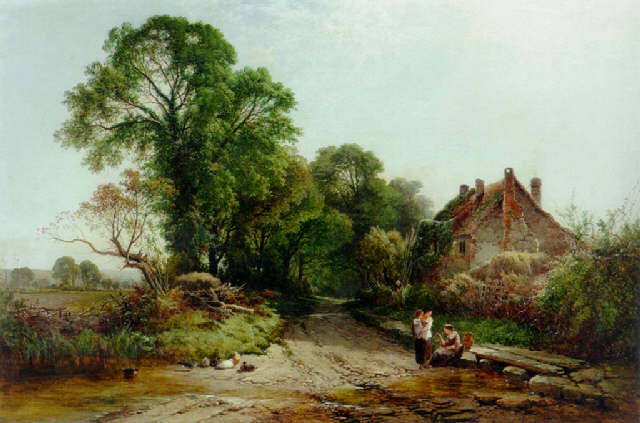 He married Clarissa "Clara" Eliza Boddington in 1832, and, even though he was born Williams, he adopted Clara's maiden name to distinguish his art from that of his father "Old Williams", and his older brother Edward Charles Williams. 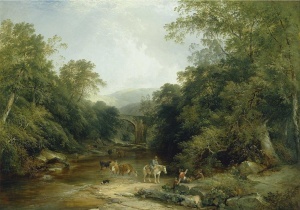 Henry quickly established his reputation as a painter of woodland and village scenes, and became so popular that he was invited in 1842, at the age of only 31. to join the prestigious Royal Society of British Artists. Although many artists exhibited at the Society's Suffolk Street Gallery, membership was exclusive, limited to 110 living members only, and Henry was the only one of his family to achieve that distinction. His membership in the Royal Society put him in contact with many of the leading artists of his day, and he even collaborated at times with fellow member John Frederick Herring, who specialized in hunting scenes. 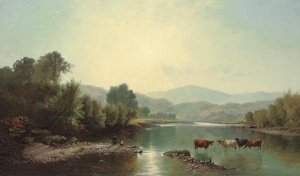 Boddington would paint the landscapes in these collaborations, and Herring would add in animals, usually horses. 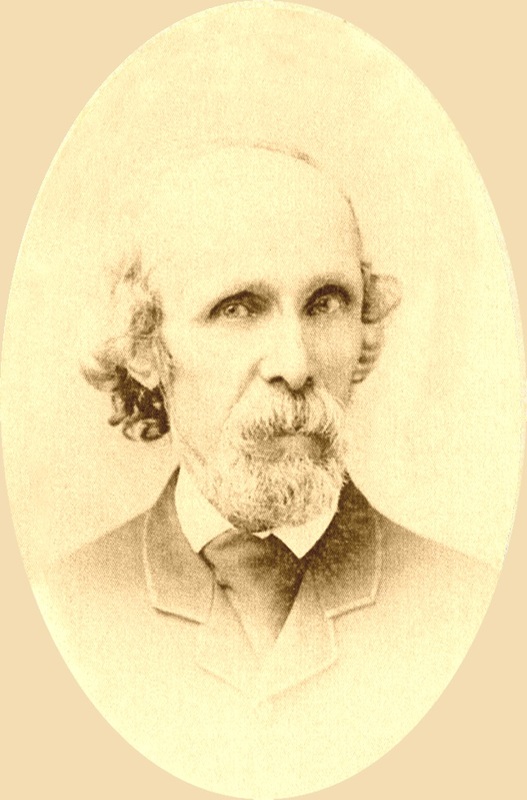 Henry exhibited extensively with the Society, and took great pride in his membership. His early life was spent with his father and brothers at various residences associated with the artists quarter near Tottenham Court Road. His only son Edwin Henry Boddington was born on October 14, 1836 when Henry and Clara were living in the Islington District of London. Later, they lived at Gray's Inn Road (1839-1846),then in Fulham (1846-1849), and Hammersmith (1849-1854), before moving finally to an expensive house on Lonsdale Road, Barnes, where Henry lived his remaining years. All of these locations are near the Thames River, which formed the subject of many of his paintings. During the final two years of his life a progressive ailment, probably a brain tumor, robbed him of his sight and abilities, resulting in some poor quality paintings. He died on April 11, 1865 at the age of only 54 and was buried, the same as his father, in the Old Barnes Cemetary under his given family name of Williams. His wife Clara, having given him her name during the course of his carrer, eventually took his name and died Clara Williams, some forty years after the passing of her husband. 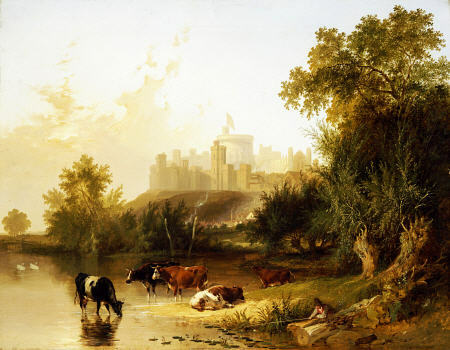 Henry Boddington's work was displayed (sometimes posthumously) from 1837 to 1869 (355 paintings) at all the major British exhibitions of his day, including the Royal Academy (51 paintings), the Suffolk Street Gallery of the Royal Association of British Artists (244 paintings), and the British Institution (60 paintings). 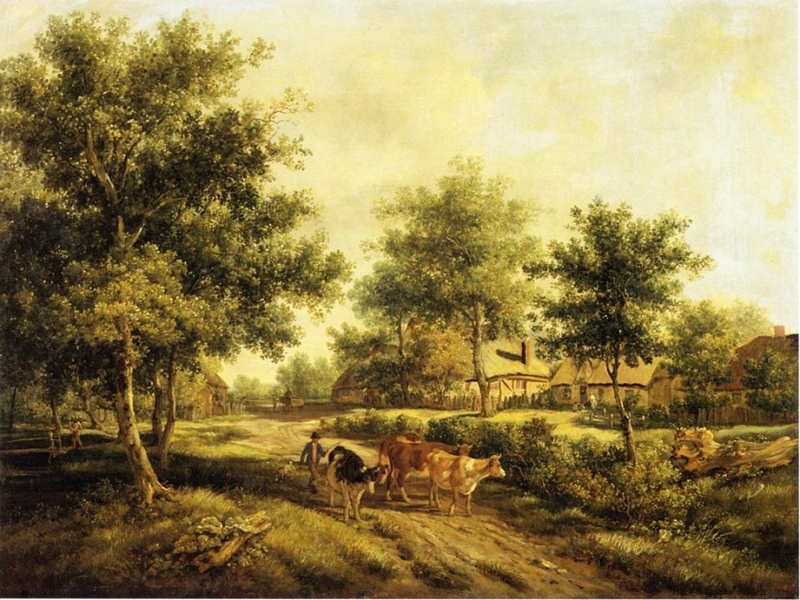 Boddington began his career as a painter of cottage and village scenes, and became so popular with this style that he was invited to join the Royal Society of British Artists, the only member of his family to receive that honor. Another painting typical of Boddington's cottage and village scenes. 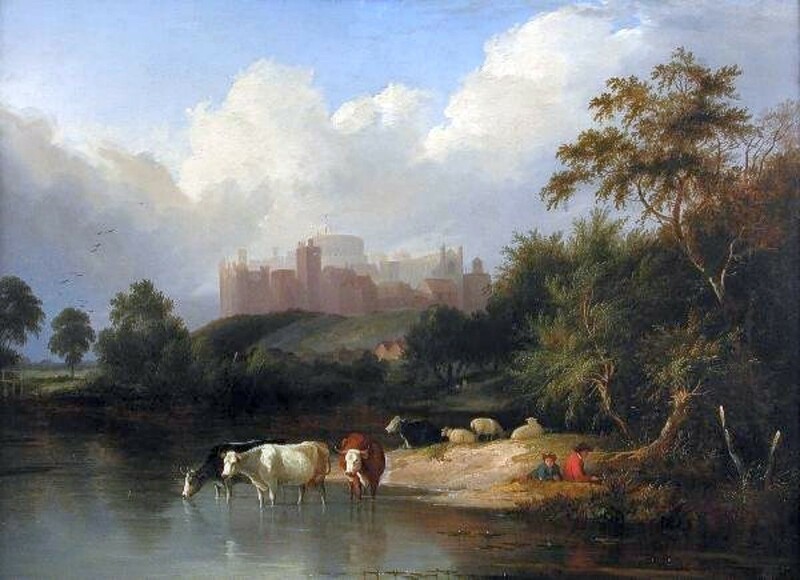 He frequently placed horses in his pictures, whereas cows, sometimes sheep, were the animals of choice employed by his younger brother Sidney Richard Percy. Two more Boddignton cottage scenes. The left-hand painting is signed and dated, whereas the on on the right is unsigned, but has been attibuted to Boddington. 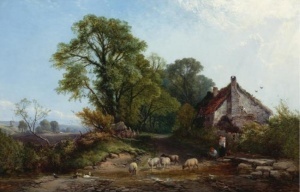 It shows a slightly different view of the same cottage, and has been titled at different times "The Ford" and "Outside the Cottage". 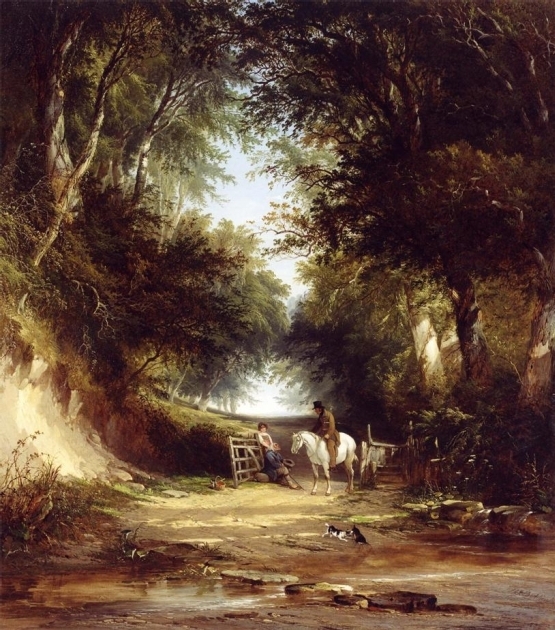 This is the classic Boddington painting, characterized by sunlight filtered through an archway of trees to light up a figure with a horse. 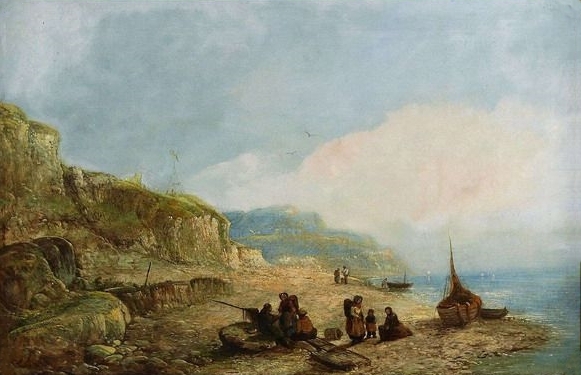 Henry Boddington had a profound influence on Sidney Richard Percy, possibly as much as their father "Old Williams", and many of Sidney's early paintings are similar in style to Henry's. 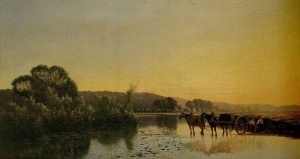 Consider Sidney's "The Road Across the Common", painted in 1851, which shares many elements in common with a Boddington painting. Both of these pictures have the same name, but show different views of the river. Boddington always lived near the Thames, and it became the subject of many of his paintings. This is probably the most widely available Boddington painting on the internet, in the form of cards and posters. It is also bascially the same view of the Thames as the one on the right painted by his father Edward Williams. 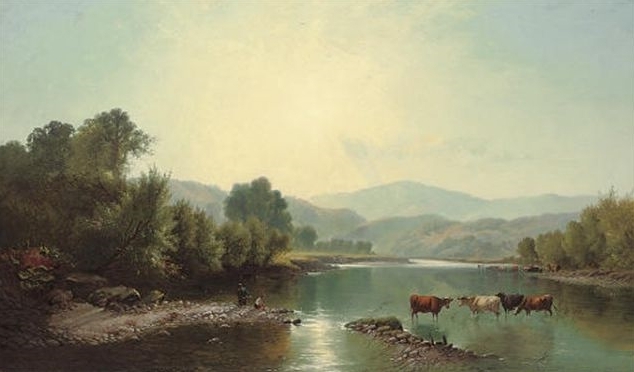 One might suppose that these were painted at the same time with father and son working side by side, which might indicate that Boddington's painting is one of his earlier efforts that was executed while still studying under his father. A landscape with cattle more in the style of Sidney Richard Percy, but with sunlight reflecting in the middle view, shade on the left, and sunlit on the right, which is a mix in light conditions more typical of Boddington's work than Percy's. Another landscape more in the style of his younger brother Sidney Richard Percy, but with the classic Boddington use of shafts of sunlight, filtered this time over the mountain ridge instead of through trees or clouds. 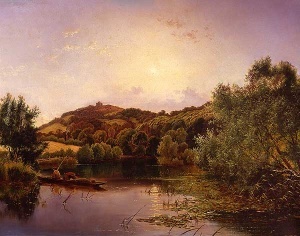 This landscape would have been painted by Boddington in the last years of his life, just before he began to lose his sight and abilities from a "brain disease". 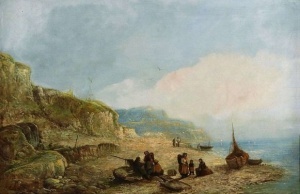 A very atypical Henry Boddington painting, as he seldom painted seascapes. It was probably painted late in his career, but there is really no way to know for sure.